On November 21, President Hassan Rouhani declared the end of the so-called Islamic State, also known as ISIS or ISIL. “Today with God’s guidance and the resistance of people in the region we can say that this evil has either been lifted from the head of the people or has been reduced,” he said in a televised address. “Of course, the fallout from [the crimes of] this group and those who have spread out in villages will continue to be there, but their base and root have been destroyed, and it was a big feat,” he said at the Fifth National Congress of the House of Farmers in Tehran. Rouhani’s remarks came days after ISIS lost its last strongholds in Syria and Iraq. Syrian troops and loyalist militiamen reportedly took Abu Kamal, a small town on the Euphrates River and the Syria-Iraq border. And Iraqi and U.S.-led coalition forces took the northwestern Iraq town of Rawa. The group’s caliphate began to crumble after Mosul, Iraq’s second largest city, fell in July. In October, the group lost its nominal capital, Raqqa, a city in northern Syria. 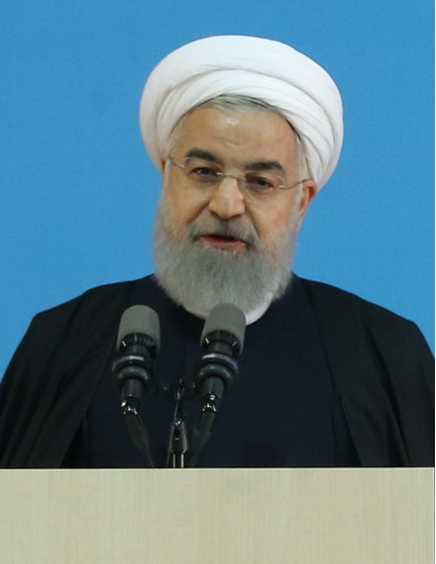 In his address, Rouhani accused Western countries, including the United States, and Israel for supporting the extremists. He criticized the Arab League for inaction on ISIS and the conflict in Yemen. “When the Iraqi people were under the attack of the ISIS and the Syrian people were fighting ISIS in Aleppo and Deir ez-Zor and the Yemeni people were under the bombing of the Saudis and the Lebanese were struggling with the terrorists, where was the Arab League?” he asked rhetorically. Rouhani also highlighted Iran’s role in supporting the Iraqi and Syrian armies in battles against ISIS. Rouhani especially thanked the commander of the Revolutionary Guards’ elite Qods Force, Qassem Soleimani for coordinating a campaign against ISIS. In recent years, Soleimani has played an increasingly public role and often traveled to the front lines. He has been photographed extensively leading Shiite militias in Iraq and Syria. Soleimani penned a letter to Supreme Leader Khamenei announcing the end of the ISIS caliphate. In it, he blamed the United States and Israel for the group’s formation and crimes. Khamenei addressed members of Iran’s Basij militia on the same topic the following day. "In the region, the Islamic Republic and you, young individuals, managed to bring the U.S. to its knees and defeat it,” he said. The following are excerpted remarks by Rouhani with the full text of Soleimani’s letter and Khamenei’s remarks. "When the Iraqi people were under the attack of the ISIS and the Syrian people were fighting ISIS in Aleppo and Deir ez-Zor and the Yemeni people were under the bombing of the Saudis and the Lebanese were struggling with the terrorists, where was the Arab League? And where is it today when the Palestinian people are being explicitly oppressed?" Definitely the valuable role of the nation and the government of the Islamic Republic of Iran--the respected president in particular--the parliament, the Defense Ministry, as well as police, military and security organizations of our country, in supporting the above mentioned states and nations, is admirable. “You have witnessed that these consecutive conspiracies, which were created in this region by the US, Zionists, Arab reactionaries and others, were destroyed by the sovereignty of the Islamic Revolution. One of the conspiracies was the inhumane Takfiri group: ISIS--which was destroyed, thanks to the efforts of faithful men, with the help of those who supported the resistance force." “Even in some of our neighboring countries, sometimes, they did not believe that it was possible to accomplish this [defeat of ISIS]. But, they had to join the fight: they entered the battlefield; they succeeded and came to believe it was possible. This is how the message of the Islamic Republic, the message of the revolution, reaches other nations."